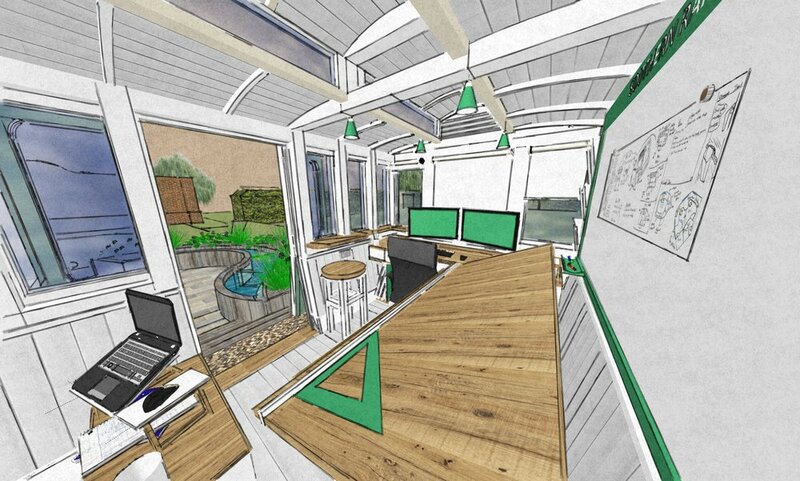 The previous blog post showed a garden design which showed how I planned to integrate one of my previous studio designs into it. I chose to try the Old Railway Carriage design because I felt it would be more suited given the site layout, the colours, and the railway interests of my dad and I. As always, this is not to say it will be built. I have other plans for this part of the garden if it doesn't. Hopefully some of you may remember how the original carriage design looked inside. You can click here if you need a reminder. Externally there have been a few changes. First of all, the entrance doors are now on the side rather than one of the ends. This means it follows the prototype a lot closer than the original design - the entrance on this version is a set of double doors. Such a set up would normally have been found on the parcels or guard/brake area of a carriage - elsewhere the doors would be singles only. However, the door to the garden store is shown as a single large door which is not prototypical. It could be changed to another double if it bothers anyone, although the single allows more width to get a lawnmower in and out, so that is worth bearing in mind. The desk is now facing the end wall rather than the side wall. 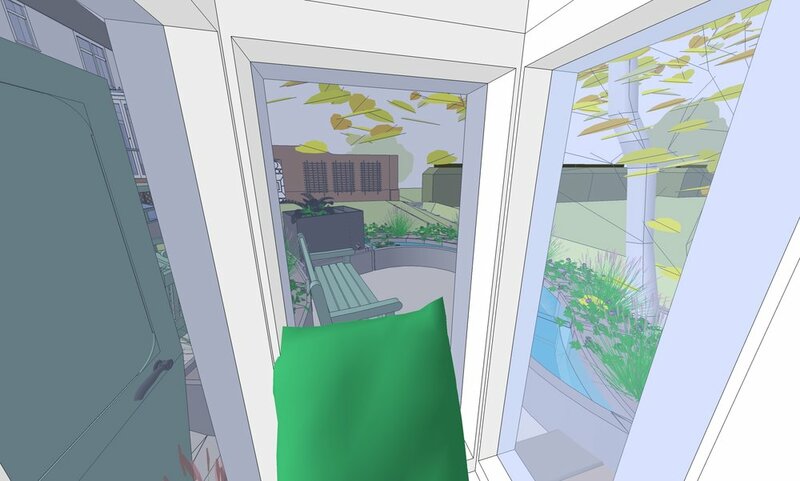 I was debating whether to do this or not - I really liked the idea of a door on the end wall so I can walk out onto the decking and sit on the bench. It would also make it easier to look out to the lovely view of the meadows. However, having it at the side made it too tight to fit in everything else I wanted to fit in, and made the room too cramped. 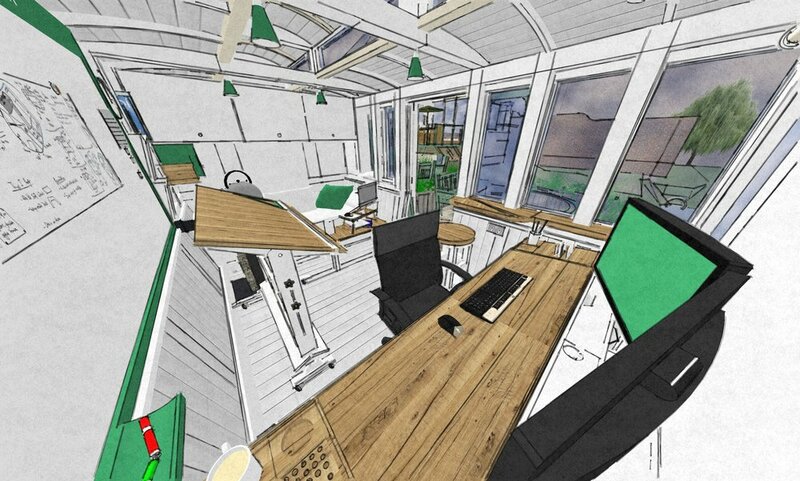 Given my interest in designing structures like this, something new I wanted to include was an architects drawing table. Whilst it may seem a bit pointless given the relatively large desk, the table would be more useful for this because it is adjustable in height, tilt, and has a ruler permanently horizontally attached making it easy to draw straight lines and angles - the ruler can travel up and down the board and be fastened at any location. It can also fold relatively flat when not in use. Behind it is a large whiteboard emblazoned with the Southern Railway insignia. Useful for making notes and quick drawings whilst coming up with ideas. Magnets can also be used to pin sketches and other bits of paper as well. On the same wall are a few wooden compartments which can hold A3 and A4 bits of paper. Further along on this wall is the other ducket with the book shelf, and to the right of that is a shelf for boxfiles. Moving onto the rear wall, there is a decent sized sofa bed with cupboards above it. A coffee table big enough for notepads and a laptop sits in front. The side of the room with the doors features only the ducket and a very small ledge on a window by the desk with which to take a break with a cup of tea whilst admiring the view out to the garden. The rest of this wall is taken up by doors. 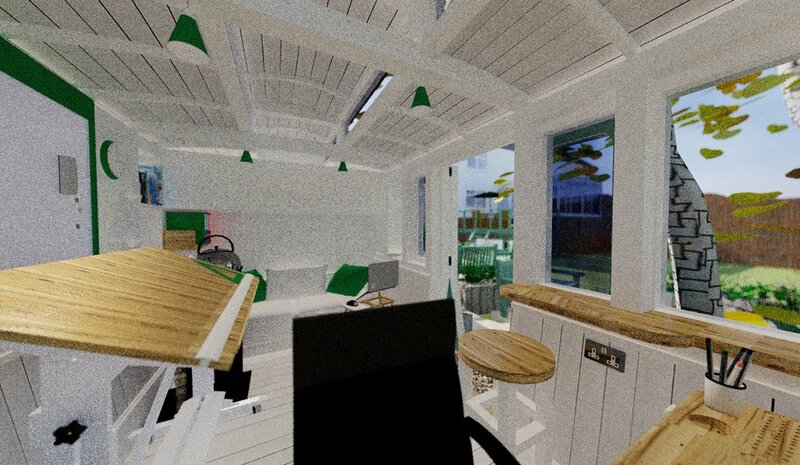 In this design it houses the garden store as already mentioned. It has its own clerestory window and light, with shelving on the back wall for plant pots and other relatively small objects. The lawnmower takes up the majority of the space, but there is room for a stepladder, and garden tools on the left hand wall. If you planned to turn this into a WC, there would be enough room for a wetroom including a shower, toilet and small wash basin. The clerestory windows would allow light in, but not allow anyone to see inside - perfect for bathrooms. What might be a wise idea would be to turn one of the clerestory windows into either an opening window rather than a fixed one, or alternatively blank one off and replace it with openable louvres. This would provide much needed ventilation - you can see one such vent on the desk end of the building. The last metre or so is in use here as a garden store. Alternatively, it could be turned into a WC. The ducket nearest the doors is in use here as a little reading nook. The other ducket is used to store the books. A general outside view shows how such a structure might fit into a garden. Outside, a suitably painted bench in Southern Railway colours completes the look. The last section I'd like to discuss has already been touched upon, but it's worth going back over again with a little more detail. As said, the main colour scheme is green and white. Although white was not particularly a common Southern Railway colour, it is imperative to small space design in order to make such a building feel bigger on the inside. It's also a great neutral colour which bounces light around, and as a bonus doesn't really age (trend wise). It's also easy to retouch. The green I feel I've explained enough! Materials are mainly wood and glass (much as such carriages would have been built), although I've made the walls a lot thicker to accommodate "new age" insulation materials. A sensible foundation would be a concrete pad with a wooden base which would mean there is an air gap under the carriage - this would help prevent rising damp (as long as you have a suitable membrane between the concrete and wood). As this is a railway carriage, my wooden portion of the base would be old railway sleepers. The carriage itself would sit on top of these. You'll notice in some images that sleepers have also been used in other places such as the steps outside. It's good to carry materials into other areas because it gives a feeling of continuity - giving the project a good 'flow' from one area to another. A good tip for small spaces in particular is to carry on the same flooring from one room to another. It's not really relevant here, but for multi-room structures it's a very valid way of making a space seem bigger. The floor here is white painted wooden floorboards. I almost went with standard oak effect laminate flooring, but it just didn't seem to look right, and made the room feel too dark. The walls are all vertical white boards, and so is the ceiling. Again, the continuation of materials comes into effect here. There are however areas that aren't white inside. You definitely want some pops of colour. 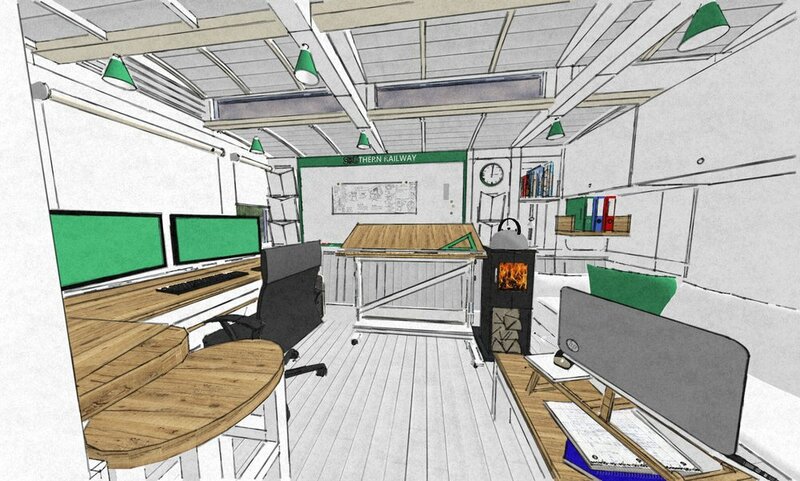 In this case I've chosen green lampshades, green cushions, and a green frame around the whiteboard. A few sections of oak give a nice contrast whilst still retaining that comfy vibe. The door frames, desk tops, coffee table top, stool top and one of the shelves are all natural oak. I have however kept legs and supports as white painted wood to minimise their impact. 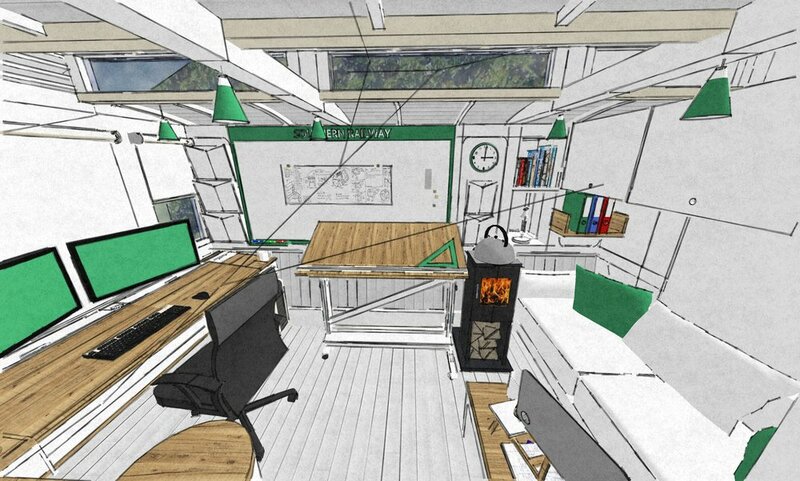 And so ends our tour of the 2nd version of my railway carriage design for a home office/studio. I hope you enjoyed it, and as always please feel free to leave your feedback below or ask questions!